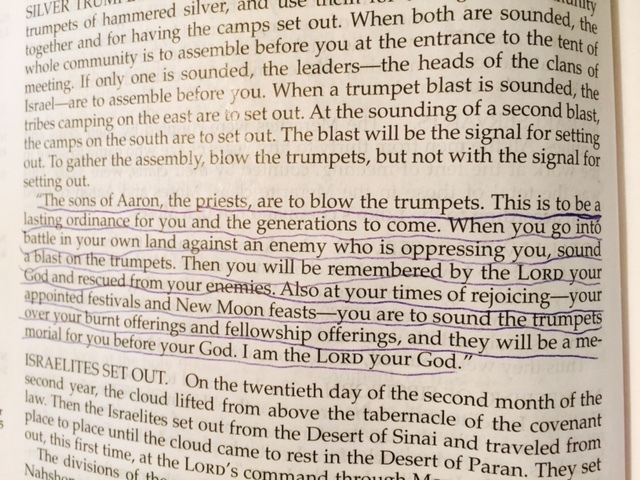 The Israelites were reminded that God was with them when the trumpet sounded. Different trumpet blasts were used to communicate various messages to them. One of the blasts told them the leaders were supposed to gather. Another told them the whole community was supposed to congregate. A different blast told them to pick up their tents and start moving. Another one was used when they were going into battle. Or, at festival time, the trumpets were blown over their burnt offerings and fellowship offerings. In all of these situations the trumpet sound reminded them that God was with them. Sometimes we could really use a trumpet blast today, couldn’t we? We’d love a loud reminder that God is with us. We start focusing on ourselves (again) and we forget that the Holy Spirit lives within us and that God wants to be involved in every part of our lives. Developing good spiritual habits is the best way for us to be constantly plugged in to God so that we don’t wander into ‘me’ land. * Regularly reading and studying our Bible, applying his word to our lives. * talking with God often and then listening, expecting a reply. * Regularly participating in worship with our spiritual family. * Regularly meeting with other Christians – encouraging each other and growing together as we walk this path of faith. Each one of these habits is trumpet blast – reminding us that God is alive within us and he is very busy transforming us to be more like Jesus. Thank you for our trumpet blasts, Abba Father.